Ohhh lovely review Keertana! I love books that have relationship and character growth between all parties involved. 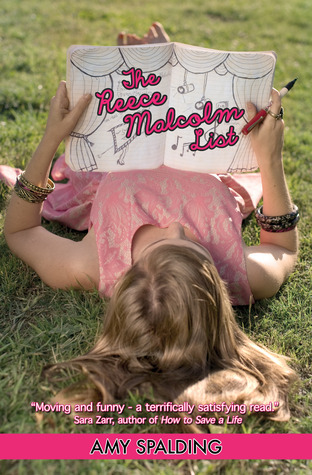 I'm definitely curious about Reese Malcolm now. It sounds like a book that I might like. Hopefully it'll be available in the library sometime soon :). I had little to no interest in this book when I first came across it, but all these positive reviews have me more than convinced now. I love the sound of Devan! And, of course, I like the Anna and the French Kiss comparison. ;) I'll definitely have to give this one a shot in a few weeks. Brilliant review, Keertana! I’m exactly the same way, Keertana! I’m much more drawn to dark contemporary novels, and I tend to automatically discount ones with girly covers, even if I’ve been assured that the contents are different. In all honesty, that feeling has been the big reason I’ve stayed so far away from The Reece Malcolm List, but I guess I should rethink myself here! I also love novels about family and family relationships—they’re probably my favorite. Less drama in a romance sounds VERY good to me! I have this one on my WL but it's your review that has me dying to get my hands on it. It sounds amazing! I'm so glad you gave it a try! I've had this one ever since it came out, but I have to admit I'm a bit of a snob myself. The cover made me think that this would be a fluffy story without any real substance, when instead it portrays complicated, layered relationships that are a true delight to read. I'll have to move it up on my tbr, you've left me no choice. I've done that before Keertana - taken one look at a cover and decided it wouldn't be of interest to me only to pick it up later and be thoroughly impressed. I love when a book proves to me just how wrong I was to discard it initially:) I really had no interest in this book, but you've definitely got me reconsidering!!! This is such a heartfelt review! I actually love 'fun' books as well as they are also quality. So rarely do I find books that make me laugh out loud. Anyway, I will be reading this one for sure now. It sounds fantastic. Thanks for sharing! I've heard nothing but positive, gushing praise for this book. As soon as I can get my hands on a copy of it, I'll definitely give it a go. Great, thorough review, Keertana! I LOVED this book! And now I am even more excited to get to L.A! Like you, I was initially inclined to write this one off, but the more reactions I see, and this review in particular have me convinced it's one of the few contemporaries I really must read this year. I was fortunate enough to attend a panel featuring Amy Spalding, and the way she talked about the mother-daughter relationship in this one really made me want to pick it up. I also love books where the romance isn't the thing, it's just an organic part of the bigger plot. We'll see though, I'm one of those who really didn't like the romance in Anna and the French Kiss, so I'm hoping it's different enough to not bother me. I am so BUMMED that I missed this one on NG. I love all types of contemporary YA, intense and issue driven as well as lighter and funny. So I am so happy you give this one a thumbs up, Keertana! And omg, did you compare the romance to Anna and the French Kiss?? Sign me up! Tonya loved this one too, just like everyone else I know--but weirdly enough, I felt relatively indifferent to the whole thing, which was so disappointing! I liked Devan well enough and the story well enough, but I just didn't find it as charming or funny or heartfelt as everyone else did. Was I just cranky when I read it? :P Oh, well. I'm so glad you enjoyed it, though. I do like that we're seeing more lighthearted contemporary YAs, though--they make a nice change from all the angsty ones that take themselves too seriously.